Because I really don’t know if he gets the right amount – if I “let” him BF too often, or if his diet is varied enough. I mean, I know there’s no such thing as breastfeeding too much, but when he’s teething or just generally antsy it’s the easiest option for comfort for him. And because I’m not spoonfeeding him, if he doesn’t want food, I really can’t just shove it in there. I don’t want to though, don’t get me wrong. Somedays you just don’t feel like tucking in (hmm, I don’t have those days actually), but I suppose when your face hurts quite often you would be put off. If I could grow the teeth for him I would. One of his front top teeth has broken through and its partner is on its way. Am looking forward to cute toothypeg photos very soon! Pear, aubergine (grilled with some olive oil) and a go of a stir fry have been new tastes this past week. The stir fry included fennel, tofu & buckwheat noodles. Sure lots of 30 year olds haven’t eaten that. 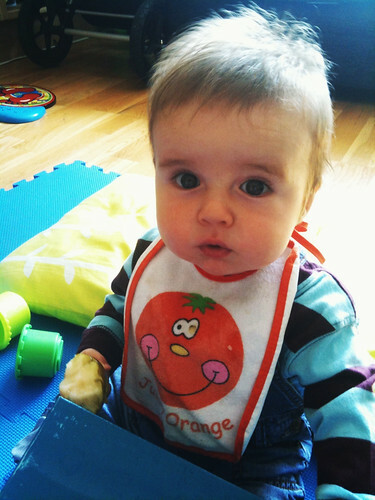 And he’s developing quite a taste for porridge too (hah – his dad, defied!). I thought i’d completely messed it up the other day – it was stodgy and the berries were half defrosted. Mean mama that I am, I presented it to him anyway, and he wolfed it down! Love of natural yogurt continues apace – with mashed banana mixed in, or on its own. I’m particularly proud of this, because I can happily finish his food – I don’t think i’d be quite so pleased polishing off half eaten Petit Filous – though doubtless I would. Another breakfast favourite I’ve scored 2 for 2 on is american style pancakes. Thats strictly a weekend option though. I guess the best thing to do is just not compare to 3-meals-a-day spoonfed babas. We have a healthy diet in general, so he must too. (I say that just after I’ve eaten 1000 mini Daims this past week – curses on you ikea!) He was eyeing me up drinking a bottle of Diet Coke on our walk earlier though. One disadvantage of BLW is that they do seem to notice exactly what you’re consuming as they often have the same off your plate. Thank the gods for Organix, their little rice cakes divert his attention nicely.